Nearly 9,900 students will graduate from San Diego State University in commencement ceremonies scheduled to begin on campus Friday morning. Graduation will be held Friday at 11 a.m. for the School of Arts and Letters and 3 p.m. for the College of Health and Human Services — both at Viejas Arena. Ceremonies will continue Saturday for the colleges of Business Administration, Sciences and Engineering; and on Sunday for the College of Professional Studies and Fine Arts, College of Education and Division of Undergraduate Studies. Irwin Zahn, who funds student entrepreneurship and innovation programs, and Susan Salka, CEO of AMN Healthcare, are scheduled to receive honorary doctorate degrees from SDSU. 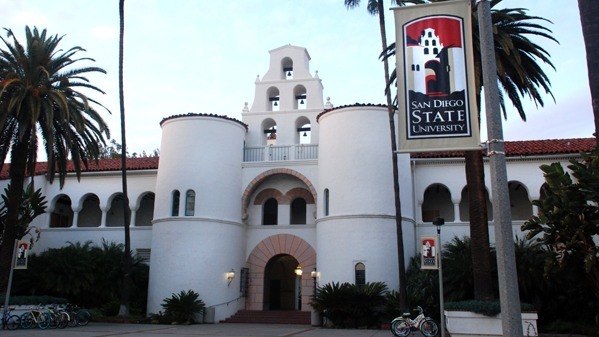 Students in the Class of 2016 will collectively earn 7,662 bachelor’s degrees, 2,189 master’s degrees and 171 doctorates, according to SDSU. Parking will be free in various structures around campus. SDSU officials suggested arriving early, and allowing 20 minutes to park and walk to the arena, which is expected to reach its capacity of over 12,000 for the ceremonies. Community colleges around San Diego County will also begin commencement season Friday. Miramar College will award around 870 associate degrees and 484 certificates of achievement. San Diego fire Chief Brian Fennessy will be the keynote speaker. Ceremonies are scheduled Saturday for San Diego Mesa College; and the following weekend for Cal State San Marcos, the University of San Diego, Palomar College and San Diego City College. MiraCosta and Southwestern colleges will hold commencement on May 27. Ceremonies for UC San Diego, and Grossmont and Cuyamaca colleges, will take place in June.